The seminar will be chaired by Nick Kounoupias of Lobby for Cyprus. In the summer of 1974 Turkey invaded and ethnically cleansed the northern areas of Cyprus, in violation of international law and the ethical principles of civilised conduct. Since 1974, Turkey has unlawfully and unethically occupied those areas in defiance of multiple UN Security Council resolutions. A disturbing feature of the post-1974 epoch has been Turkey’s assault and neglect of the rich cultural heritage of the areas under its illegal occupation. Turkey has engaged in an obvious programme of de-Hellenisation, de-Christianisation, Turkification and Islamisation of the areas. This ethnic cleansing has not only had adverse consequences for Hellenism, but also for the Armenian, Maronite, Jewish and others who formed part of the landscape of pre-1974 northern Cyprus. Among other crimes, ancient sites have been vandalised, churches, synagogues and cemeteries have been desecrated, mosaics have been ripped out and icons have been looted and illegally sold on the black market abroad. All of which this is not only an affront to the dignity of those who were forcibly uprooted in 1974, but also a violation of international law such as The Hague Convention for the Protection of Cultural Property 1954. It is about time Turkey was held accountable for its crimes. 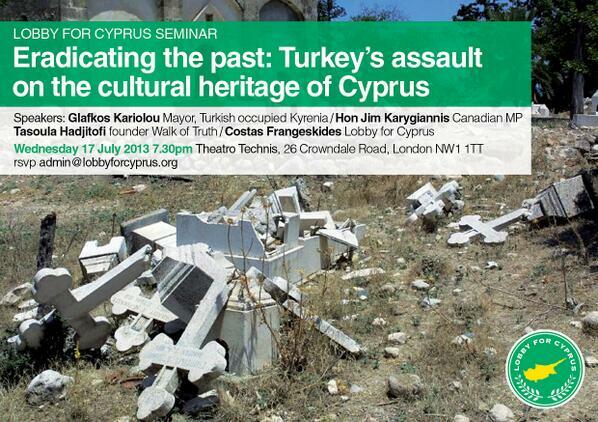 The seminar is part of Cyprus Week at Theatro Technis, which will mark 39 years since the Turkish invasion and occupation of the northern part of the Republic of Cyprus. Admission to the seminar is free.